I've lived in Ohio most of my life, and have 3 sons, 2 in Ohio and one in California. We have moved to North Carolina and have made it our permanent home. Love living by the ocean! I'm a former quilter of 30 years, but in retirement I've been trying several crafts. Right now I'm into miniature houses, whether they are made of paper, cardboard or wood. The paper ones are at a scale around 1:144, but the dollhouses I will be attempting to build are 1:12. I love crafting, reading, puzzles, gardening, and going to the beach. Hurricane Florence has forced me and millions of other people from their homes. We evacuated two weeks ago to Ohio, but will be starting the journey back tomorrow. Luckily, my house came through the storm almost untouched despite the eye passing directly over our roof! So, this is just so let you know that I will be back posting soon! Thanks for stopping by! I don’t even know where to begin because I’ve just been working away and not blogging, but I have been taking pictures. I put up curtains on the front door and the front living room window. Also, I finally received the German porcelain tiles I ordered for the sink backsplash. Oh, the kitchen sink finally arrived as well. As you can see, I also made a corner fireplace and tiled the front and the hearth, too. I thought it would do a lot for the overall look to carry some common features into the living room. The sink turned out well – after careful measuring and gluing the tiles on, I decided the underside needed a more finished look, so I did the narrow wainscoting underneath, as well as gluing on a strip of wood to help support the sink. That worked out very well. Now I’m ready for the Wall! I repainted the icebox because it was hideous. I picked up a small craft paint bottle of gloss enamel to paint the stove and redo the icebox. Turned out much nicer looking than flat paint. The soft yellow cupboard is glued in place. I did order a few accessories for the kitchen, the egg basket you see on the sink, a bowl with two broken eggs and a whisk, two towels, and some extra eggs for when I build the chicken coop in the garden outside the kitchen. Oh, also got that cute little “rag” rug on the floor, and was finally able to fasten the screen door on. Squeaky and Sky are very excited that Mom Laura will now be able to cook! I have also painted the wall surrounding the screen door yellow, as that was the only plain white wall left in the kitchen and it needed some help. I’ve been working on the 3 (working!) chandeliers for the main floor, and managed to put one up, as well as hanging 2 shelves I made over the stove for pots and pans. Lookin’ darn cute! I love it. One more chandelier over the table, and the kitchen is done. I have some plates and cups that need to be stored in the yellow cupboard over the sink, but that’s it – until I fuss and think of something else…. Check back in a couple weeks for more updates! Oh! Here’s a shot of Mama Bear Laura all ready to duck out the back door and head to the market and the butcher! So, I’ve just wiped out what I did type already by hitting the back arrow. Who knew? Just everyone but me. Let’s see how far I didn’t get recently… I’ve painted the plaster to seal it, painted a tin ceiling looking paper a color called “cloud” by Martha Stewart and used it on the peaked ceiling of the sun room, too. Trimmed out the ceiling and floor in the living room, and started painting the appliances. I painted the table and chairs – they’re done. I painted roses on the table, painted the legs green, and painted roses on the backs of the four chairs. That item on the left is the ice box. I started painting it white, then a pearl white/grey, now it’s yellow and green. The cupboard on the left is purchased, but I love the creamy yellow (it’s upside down, by the way). So, I used daffodil from the Martha Stewart collection to paint the ice box to kinda match. I’m not the greatest mini painter, but it will be tucked back in the corner in the kitchen and no one will notice. So, base painted the wood stove white – Dave says I should find a gloss white for it so it looks like porcelain. Maybe. It has an oven rack, a silver railing for across the front, and gold ball handles for the small oven doors. Why silver and gold? This is where the cabinet will go over the sink on the dividing wall. You can see that this will be a crowded kitchen – no wonder I had to build on the sunroom to accommodate the table. You need a big house to make a nice kitchen. My decorating period for this is around the 1920’s to 30’s, I guess. Ice boxes, wood stoves, and an old fashioned sink. But, I’m not gonna do modern and I don’t want Victorian, so this is the period I’m left with. And I like that. There’s a great old fashioned electric refrigerator out there, but it’s $60!!! I don’t love it that much yet. I’ll stick with the ice box. My dad remembered an ice box on the farm, and he was born in the 1920’s, so it’s not unreasonable. I should be making the 5 or 6 chandeliers I’ll need to light up the house while I’m waiting for the sink, fabric to make the chairs, and hinges for the screen door. I don’t want to move to the second floor before I get the dividing wall for the kitchen solidly in place. I have miniature ceramic tiles I ordered from Germany to be the backsplash behind the sink. Aren’t they cute? Tulips and hearts in green, yellow and navy. I have 30 printed tiles and 100 cream tiles. I won’t be using them all on this house. Can you imagine making such tiny ceramic tiles? Imagine me gluing them in straight lines, and then grouting them! But, they will “make” the kitchen with the yellow cupboard and white antique sink! I love the texture of the plaster on these two walls. The bay window will become a window seat for reading once I get my fabric and make a cushion and pillows. Curtains will be lace? Roman shades? Something. Okay, I’m done talking about nothing. Tomorrow will hopefully be a more productive day. So, I cut a pattern on paper of the floor in the kitchen and sunroom, painted it brown, then glued the individual vinyl tiles on the paper. The brown can be seen between the tiles, eliminating the need for some kind of fake grout. With that done, I just ran the glue bottle all over the wood and pressed the tile paper on top. Perfect! See the ceiling? I had glued that in permanently. The beams 4 white beams I glued on the ceiling did the trick to keep it from warping before installation. The pretty screen door is not mounted in place yet, still waiting on the hinges. Squeaky and Sky couldn’t wait any longer to see their new house. They even carried over the bench from the porch of Rosebud Cottage so they had somewhere to sit and watch the progress. They can’t wait for their Mum, (Laura), to start baking in the new kitchen…. That’s Laura on the left, Grandma Katherine on the right. I don’t have a house big enough for Katherine, she’s 6 1/4 inches tall. The ceilings in the cottages are only 8″ high – she’ll be dropping by often to visit – we’ll keep a larger chair for her to sit comfortably. Sky and Squeaky are a little intimidated by her size, but pretty soon, they won’t even notice. I did rebuild the bay window, dry fitting to make sure it would cover the window opening. I then glued it to the house, and attached the roof. I decided to give it the look of aging copper, and I carried that look over to the four-sided roof I built on the sunroom. This is a shot looking up into the copper roof of the sunroom. It was pretty tricky to build – first I glued skinny supports all around the tops of the walls, cut out the pieces I fitted first with cardboard, then glued them in place one by one. I supported the individual pieces with skinny beams glued at the intersections. Let it dry overnite, and it’s solid as a rock. Aileen’s Original Tacky Glue is the one to use in this instance, because it sets up real fast, unlike wood glue. I might run beams crossing each other at regular ceiling level to be able to hang things from – plants, sparkly lights….hmm. Today I was also working on gluing popsicle sticks to the living room floor. Pretty soon, the dividing wall/staircase between the kitchen and living room will be glued into place. Still working on it fitting smoothly into the alloted space. Some adjustments will still be necessary – it seems the more I finish off the bottom floor, the more difficult it is to slide the wall into place. Two last pictures – the “kids” were getting bored – Sky was running in and out the front door, and Squeaky was doing handstands in the corner of the room! Earlier, they let the chickens into the house, along with their new pet, Dilly the Dachshund. The chickens will be living outside in the chicken yard with their own coop eventually. Lots of work left to do! So I glued about 1/2 the wood strips to the balsa wood, and as it was drying I noticed it was starting to curl up – so I covered it with plastic wrap (I’ve had trouble with paper sticking to the glue that seeps out when wood is drying, only to have solidly glued on paper on my finished product), That seemed to work, so I proceeded to glue the remaining half. Weighed that down overnite to dry so it would be flat for the next day so I could glue it to the kitchen ceiling. In the morning, I realized I had to drill the holes for the chandeliers before I mounted the ceiling. I knew I needed one light in the heart of the kitchen, then decided I would also put a chandelier over the dining table, which will run half in the kitchen and half in the sunroom – so I drilled a hole for that one, too. I can run 3 lights on one switch, or opt to get a 6 light switch. But then I thought that it would be nice to be able to turn on some light in the house without everything coming on at the same time, so I’ll run two – 3 light switches. Six chandeliers should be just about right. You can also purchase individual battery operated sconces, lanterns, ceiling, and table lights. Okay, so, before I install the ceiling (which is still warped by the way, just to make things difficult), I needed to finish the walls of the kitchen first. So, I put fake bead board wainscoting (corrugated cardboard) on the bottoms of the 2 walls, trimmed it out, and painted the top of the window wall Scallion green from Martha Stewart’s line of craft paint. Painted the wainscoting white (wiil finish that on the stove wall). The top of the stove wall (it’s only 4 inches because I cutout the rest of the wall to create the sunroom) is the checked wallpaper, which also goes on the 15 pane window wall in the sunroom. That leaves the screen door wall, which I will paint white. When the walls are done, I can install the kitchen ceiling and the floor. Instead of popsicle sticks (for the floor), which will be throughout the rest of the house except for the bathroom, I bought a vinyl stick on 12×12 square in a brown that mimics the look of stone. My heart kept wanting to make it a wooden floor too, but my head wants to try something different. I think I’ll like it in the end. This floor can be built on a base of thin cardboard or balsa, too, so that if I ever want to change it out, it will be easier to remove – and, it will be easier to glue down. If I place them the tiniest space apart, it might mimic the look of real stone more than if I just threw the scored slab down. Decisions, decisions. This build is full of decisions. I also glued the 3 pieces of the bay window together for the far wall in the salon, but realized when I went to install it that it wouldn’t fit – the angles of the side windows do not allow for attachment to the house, so today I will pry them off the main window and perform a redo. That’s it so far – off to church in a little while, then back to work this afternoon. Stairs are done, starting on Kitchen! I got this great idea to make a sectioned staircase because I really liked it – but, it took me 2 full days to execute it, AND, it takes up more room than if I had just put it going up along the wall. I probably made it harder than it really is because I had to figure out the dimensions and construction all by myself. The first dollhouse was easy because I had a step by step guide on what to do next. I have the staircase almost done except for some trimming, then I have to decide what I’m going to do to the wall it’s attached to, and the opposite side which is a kitchen wall. The first picture, from Pinterest, is the look I’m trying to achieve, except mine will be turned 90 degrees (and not as fancy, as this is Shabby Chic). I first determined where on the stair stringer I wanted to make the cut. I just wanted a short turn to the 2nd floor, so I cut it at 6 and 3. Here it is glued together with the stair treads. As construction progressed, I found I had to eliminate the top stair tread on the long section, and put that as the top step in the short section. After a lot of blue tape attempting to get a perspective on how it would fit, I finally had to bite the bullet and start gluing it to the dividing wall. The back wall, which is nonexistent in a doll house so you can work inside, ended up just being a half-high wall to support the first section of stairs. Then I had to cut a landing to make the turn and start the final section. I glued a support stick to the dividing wall to support the landing, then glued the final section. Spent a lot of time waiting for the Gorilla Wood Glue to dry in between steps. One word about the Gorilla glue – this stuff dries crazy hard – I had to pry one piece of moulding off, and it was a tough job. That staircase isn’t going anywhere! Here are pictures of the final product. My main issue was that I didn’t check the the treads weren’t skewed before it dried, and they were. So it’s a little cocksided, but not horrible. I also cut a door to the kitchen rather than just have the entrance to the immediate left of the front door. I wanted to create more kitchen wall space. I trimmed out the sides of the stairs with “skinny sticks” because they just looked too “raw” for me (see 1st picture of the stairs rubber banded and drying. See how the sides are just ugly? I didn’t want the stair to look like a cut up ladder). I wanted to make it look like shiplap, but it looks a little more modern on the angle. I’ll see what I can do with paint, etc., to shabby chic it up more. I also backed the stair treads with pieces of wood so you can’t see thru the stairs. I kind of liked that look, but I have to figure out what to do with the space under the stairs now. I’ll trim out the walls, and I found a pic on (where else) Pinterest last nite (two, actually) that provides some ideas. First, this same pic of the stairs, but see the built in bookcase under the stairs? And secondly, which I think I favor – They (?) created a little private nook with a desk and chair, or I could make it a reading nook with a padded chair and a floor lamp. So, today, I will do some more painting on the stairs, maybe attempt to make a hand rail, work on the walls, etc. That’s my new motto. I”ll just keep repeating it over and over – because, here I am 4 days later, and I’ve only made a little more progress over my anticipated. Did get all the windows in the walls, finally. Lots of painting and waiting for glue to dry. Dave had to help me get the walls and floors together yesterday – I needed at least one more hand while I was hot gluing and trying to line everything up since the glue dries almost instantaneously. Ohhh…that was a big work. There were some redo’s and a lot of sweating – and I was even in the air conditioning. Just lots of stress. Here are some pics for my efforts… You can see how I’ve redesigned the front windows to match the purchased front door, enlarging them 100% and repeating the transom windows from over the door. Makes a nice cohesive front. Above is the right side of the house – the hole will be a bay window. The inside pic shows how the gabled roof will look when on – right now it’s just taped in place so I can figure out where to put the room divider on each level so it doesn’t mess with the gable windows. This is a little 5 inch bump out I did on the left side to give more room to the kitchen so I can place a dining table. That’s a green screen door I made from the left over front door from the kit – just cut out the panels and sandwiched screening between identical doors. The 15 pane window is purchased – I thought it matched the panes on the upstairs windows . Here is a look from the back at the little bump out. I had hoped to put an angled roof on, but there is only room for a flat roof because of the window directly above. I will be gluing this porch post in place to help support the 2nd floor since that part of the wall is now the window wall. Above we are looking at the house with more of a realistic perspective as to it’s size. And the last pic above is my work room where the magic happens. It’s actually a 6 foot folding table set up in the sun room. I like working out here in the summer so I can keep an eye on all my neighbors. Har Har. This little beauty is Katherine, a new bear from Shaz Bears created by Sharon Hale, direct from Australia. I ordered her because her name is the same as my Godmother Angel, and I wanted to build her a house. Aren’t her clothes gorgeous? She has the exact Shabby Chic look I wanted, and she’s in pink – Aunt Kay’s favorite color. However, the description of her size was incorrect and I ended up with a bear that is 6 1/4″ instead of 4.7″. She is too big for the 1:12 scale bear houses I build. I contacted Ms. Hale, her creator, and she generously sent me another bear which I just received today. Her name on her tag is Laduree, which is a French Pastry shop specializing in macaroons. But Ms. Hale said I can call her Laura. I love the celedon color of the inside of the shop. Anyway, Laura looks very much like Katherine – so much so that Katherine could be Laura’s mother! 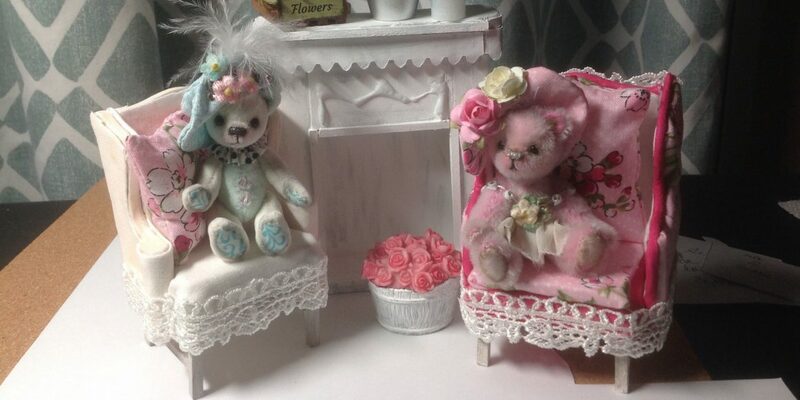 Laura is 5″ tall, which is still larger than my other bears which come in at 3″ and 3.5″. I’ll have to make bigger furniture for Laura when I build her house. Anyway, today I spent all day working on the staircase for the new house. The instructions call for placing the staircase on the far right of the house (looking inside from the back) against the wall – there’s even a hole cut in the ceiling for access to the top floor. However, that area of the house is where the kitchen is going – and I don’t want a staircase taking up the space. I also didn’t want it smack in your face when you open the front door, which was another possible location. I ran across this layout of a stairway on Pinterest which I love for the design, and the small space it occupies. or this: Mine will be similar, and I like the idea of the built in bookcase under the stairs. Or a little closet….